Deputy Chief Ronnie Villanueva was appointed Commander of the South Bureau in January 2018. Chief Villanueva joined the LAFD in 1983. He was promoted to Captain I in 1994, Captain II in 2003, Battalion Chief in 2006 and Assistant Chief in 2011. His most recent assignment was as the Assistant Bureau Commander for Operations South Bureau. Chief Villanueva is one of the most experienced commanders in the Department. His assignments have included management of one of the four emergency operations bureaus, Assistant Fire Marshal, Chief of Staff to the Fire Chief, Harbor Homeland Security Commander, Community Liaison Commander (senior Department spokesperson), Division Commander, Battalion Commander, Station and Company Commander, and as with all members, firefighter. During his career, Chief Villanueva has been involved in some of the most significant incidents in Los Angeles history, including the 1994 Northridge earthquake, Civil Disturbance following the 1992 Rodney King verdicts, the 1988 First Interstate Bank High Rise fire, the 2008 Metrolink Disaster in Chatsworth, and multiple wildfires, including Sesnon, Marek and Sayre. As a Battalion and Division Commander, Chief Villanueva has worked in every section of the landscape that makes up the 471 square miles of Los Angeles. 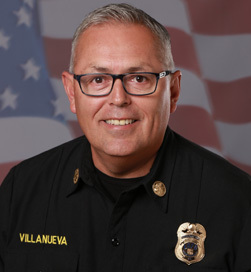 Chief Villanueva is a Los Angeles native and earned his BS degree from California State University, Long Beach in 2004. He holds a variety of other degrees and certificates focusing on leadership, fire/rescue management, and incident command, including from the Harvard/Kennedy School in Boston.